Note: Calculation can be based on any 3 items above. If no results after click "Calculate" button, then the data provided is impossible to shape a triangle. Note: If no results after filling in all coordinates, then the data provided is impossible to shape a triangle. Triangle has three sides and three angles. The sum length of any two sides is longer than the length of the other side. All angles of a triangle always add up to 180 ̊C. 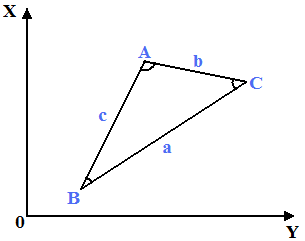 Triangle has three types based on its three angles, including obtuse (1 angle > 90 ̊C), right (1 angle = 90 ̊C) and acute (no angle > 90 ̊C). It can be divided into three types based on three sides too, including scalene (no equal sides), equilateral (all sides equal) and isoscele (2 sides equal). All three angles of a triangle always add up to 180 ̊C. Triangle has three types based on its three angles. all angles < 90 ̊C. Triangle has three types based on the equality of its three sides. no equal sides and angles.